Emazdad’s Stress Free Mega Fun Filled Birthday Parties bring The Loudest Laughs, make The Widest Smiles and produce The Happiest Memories and be the talk of the playground for a long time. Emazdad will make the whole thing as stress free for you as he can make it. All you have to do is say hello when they arrive, feed them when it's time and say cheerio at the end. Whether it's in your own home, or a local venue, Emazdad will tailor his party to fit into almost any size room. He brings with him everything he needs to ensure your Childs party is a huge rip roaring success. Thank you very much for today you made jacks party go very smoothly and he had a great time! I think all of the children had fun and I know jack and Megan can't wait to see you again, I think Megan is planning on you coming for her birthday later in the year!! Thank you for making today special. A Fun Fest of Silliness, Magic, Balloon Modelling and Audience Participation. Featuring Stinky Rat and Marmite the lion and starring the birthday child and their friends. The most important person at the party is the Birthday child, and Emazdad will ensure they're made to feel really special. They get to help twice during the magic show, once at the start and then at the end when they help with Marmite the Lion. They finish the show with a special Balloon Surprise and their own 15 Trick Magic Set, a Magic Wand, A special Balloon Surprise and a 4" Furry Animal. Emazdad's Stress Free Parties include lots of Fun games and Party Dances. He doesn't play any elimination games, so no-one is ever out and he gives out lots of prizes. None of the prizes are sweets, instead he gives out proper little toys which the kids can take home and play with. The entertainment will continue throughout the food break with Emazdad's TV Theme Tune Quiz. For some reason the birthday child always seems to win more than one prize during the games, even with over 20 years experience I haven't a clue how that works. 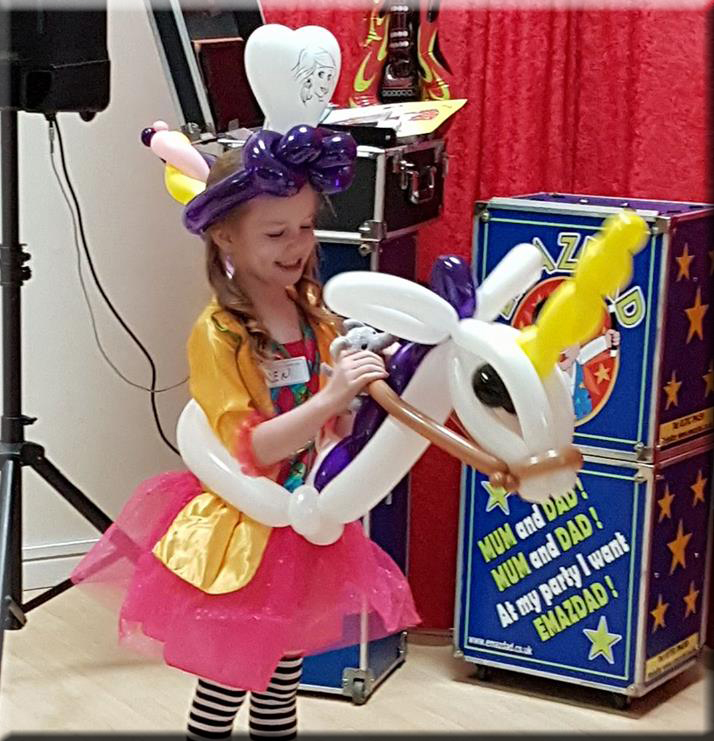 Emazdad does not only do Birthday and Christmas parties, in fact he is the perfect entertainment for all events where there are children who need entertaining.